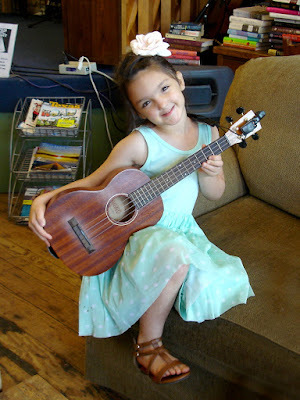 Today at the Ukulele Club meeting, our friend Abby was very interested in borrowing my uke and showing it to her friends. Since attendance was sparse, I let her have it for quite awhile. She appears to be enchanted with it so perhaps she'll join the Club one of these days. Since she's 5 years old (she said she used to be 4) I think she has plenty of time to learn. I'm sure she's going to be a good singer. While I was showing her how to tune, any note I plucked, she was able to sing it perfectly. Her pitch is dead-on, it's very exciting!